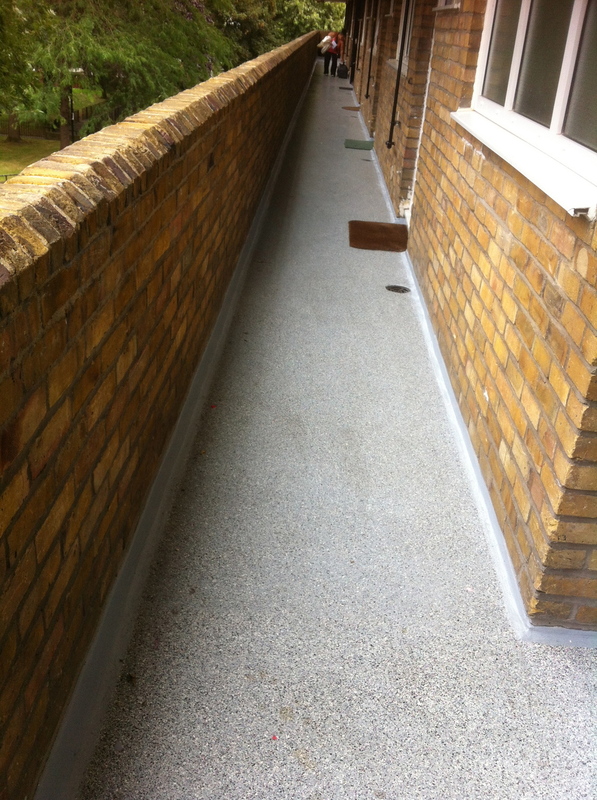 Primars are a leading installer of the RPM Vulkem Quick Balcony system and Repoma roofing systems. Both offer technical and aesthetical, market leading solutions. They are hard wearing and quick to apply, with upwards of 100 - 150 m2 completed in a day. The ease of application is a key factor in the refurbishment sector. The surfaces are first prepared by cleaning and grinding off any surface contaminates, as necessary. A sealer coat is then applied, followed by a membrane coat (this is the main waterproofing Layer). Finally a coloured topcoat is applied. This can be left as a single colour or a decorative flake or quarts finish can be added, which is then sealed with a clear sealer coat. One of the most popular systems we apply is finished with a half flake. The flake takes your eye off the inevitable dirt that collects on these public walkways. The final sealer coat incorporates a quarts no-slip granule to make it safe whilst remaining one of the easiest systems to keep clean. It is suitable for both internal and external use and comes with a 20 year manufacturers warranty.